"Lots of people are moving in and out of our neighborhood," my daughter observed last night. I'm not sure that the present turnover rate is much different than the average rate over the 2+ decades we have lived in our home. Maybe it's just that some of the recent moves have directly impacted our daughter. Or maybe she's just now at an age where she is recognizing this kind of thing. Then my daughter said something that surprised me. "It was kind of sad when the Browns* moved away." (*Names changed to protect the innocent.) I immediately understood that she was talking about our former neighbors of more than six years. But that was not their surname. It was the surname of our neighbors' step-grandchild who lived with them only temporarily. I realized that this connection was the context through which my daughter interpreted the entire family. My mind jumped back to my childhood neighborhood and I understood that kids see neighbors and neighborhoods differently than do adults. Although I had interacted with many of my neighbors for most of my life, I didn't even know the surnames of many families in the neighborhood until I became a newspaper carrier and had to collect subscription fees from these people each month. Nor did I have any clue what most of these people did for a living. I knew that one friend's dad worked for the U.S. Forest Service because he drove an agency truck. I knew that one lady down the street worked at a local pharmacy because we'd see her working when we went there. I knew that one guy worked for the local Wonder Bread bakery franchise because his mailbox was painted like a loaf of Wonder Bread and his family gave out miniature Wonder Bread loaves for Halloween treats. My scoutmaster worked as an engineer at a firm that did some kind of high tech stuff. But I had no idea what that meant. Most of the adults in the neighborhood were only relevant if I had a connection with one of their children. Or if they were known to be prone to getting after kids that happened to wander across their yards. Or if they taught us at church. Even then I usually didn't know what they did outside of that context. People went to work. People came home from work. As a kid, it made little difference to me whether they were accountants, clerks, maintenance workers, bureaucrats, entrepreneurs, or just about anything else. School teachers were a rare departure from this paradigm. I was shocked the first time I understood that one lady in our neighborhood was a school teacher. The idea that the teachers and administrators at our school existed as normal human beings with families and normal life concerns boggled my mind. We considered them akin to some kind of alien breed that existed only within the context of school. When I understood that some of them had kids my age that had ordinary struggles with schoolwork, I thought, "Whoa! Is that even possible?" Adults and children tend to view the neighborhood culture somewhat differently as well. By my count, about 42% of the homes in our current neighborhood are inhabited by their original owners (or at least the owner that lived there when we first moved in). Some homes have turned over only once over the space of many years. Others have turned over frequently. These transitions, as well as normal aging, can gradually change a neighborhood's personality as residents come and go. Our neighborhood now has mature trees. It is still filled with children, but there are far fewer of them than there were during the first decade we lived there. People that don't feel like they 'fit' a neighborhood's personality tend to move out before long. That was the case with the neighborhood where we lived when we first got married. It wasn't a bad place. We just felt like we belonged somewhere else. The thought that we would sell our children's childhood home, which seems at their current stages of life to be the main repository of everything they hold dear, comes across as jarring to them. But we won't need all of the bedrooms and stairs when we reach that phase of our lives. And I suppose our kids will eventually come to realize that the structure is not as important as the unseen ties that bind us together. My travels regularly take me past the home in which I grew up. I have mixed emotions each time I drive past the place. The adult in me says, "Good riddance." I took on significant property care responsibilities during the last five years my parents lived there. I'm glad that Mom lives in a more manageable home now. But the child in me feels certain pangs every time I see the old family homestead. Illogical as I know it is, it's as if the physical place somehow actually contains countless priceless memories. I'm not sure this will ever be fully resolved in this lifetime. How Would You Like a Driverless Car? Senior Wall Street Journal Editor Dan Neil predicts in this op-ed that the robo car (i.e. no human driver) is on the cusp of going mainstream. He predicts nearly 100% adoption within 25 years. While the praises Mr. Neil sings of this coming paradigm shift are alluring, I'm somewhat skeptical. After all, I've been hearing about the near future self driving car and flying car my whole life. Mr. Neil begins his article by describing the flawless execution of an automated BMW on a challenging California race track. This seems odd because it is obviously a highly controlled environment and the car is merely 'replaying' the driving previously done by a professional human driver. This seems a long way from being ready for operating in real time traffic. Why not showcase the Google driverless car that has already completed nearly half a million accident free miles in real traffic and is already legal to operate in Nevada? Neil spends much of the article working to disabuse readers of the "myth" of "the American Romance with the Automobile," which he chalks up to little more than an effective marketing campaign that is actually "a massive, crushing lie." Neil is wrong. Marketing campaigns are only successful when the broad customer experience somewhat resembles the campaign's claims. Everyone understands that marketing emphasizes the positive while de-emphasizing the negative. But campaigns that go too far afield from reality fail. By Neil's own admission, this campaign has succeeded for more than a century, so it can't really be as big of a lie as he claims. Still, even the automobile romance could be overcome by vehicles that offer greater freedom than the current system. The big advantage of driverless cars, claims Neil, is the immense productivity jump people will experience by being freed from operating a vehicle while commuting. Maybe some people will just waste time, but Neil says that work addicted Americans will use their commuting time to unleash one of the greatest waves of productivity the world has ever known. Frankly, this sounds more like evangelizing than reporting. Many readers have responded to Neil's article with observations of their own. Most seem to accept the proposition that the driverless car is on its way. Some relish the thought. Some think adoption will take far longer than suggested. Some doubt the proposed 100% adoption rate. Some readers think the driverless car will be slowly adopted like most other mass market products. It will initially be expensive and will be used only by high end buyers. Many bugs will be worked out of the system as competitors find better and cheaper ways to build driverless cars that work. It will take a long time before people at the lower end get such cars. Several readers suggest that the trucking industry will likely be an early adopter, with private vehicles coming on board later. One reader imagines huge savings and safety improvements from getting sleepy (druggy), error prone human truck drivers off the road and off tucking company payrolls. Others suggest that it will be a long time before a truck can drive itself very far without having a qualified human ready to take over operation in the event of a situation the automated system can't handle. A commercial airline pilot friend recently regaled me with descriptions of the marvels of automated flight. He said that pilots joke that cockpits will eventually have only instruments, a pilot, and a dog. The pilot will be there to take the instruments in case of autopilot failure. The dog will be there to bite the pilot if he tries to otherwise touch the instruments. In a more serious tone my friend wonders whether the pilot will still have the necessary skills if he has to take the controls. The same could be true of autopilot cars. At first they would only operate with a qualified driver at the wheel—someone that would have to be sufficiently alert and trained to handle system failures. Perhaps over time, as systems improve, the human copilot will become superfluous and people will lose the skills necessary to respond to a driving emergency. Then some of the scenarios imagined by various readers might become reality: cars that ferry elderly and handicapped people wherever they need to go, RVs that drive you to your destination while you sleep or watch TV, and the like. Maybe even teens that make out without ever 'parking.' But we're likely a very long way from that point. Many readers point out technical and non-technical problems with Neil's driverless utopia. Who, for example, is liable in the event of an accident; the non-driving car 'operator' or the car company? I personally wonder about being able to go off the beaten track; something I do on a fairly regular basis. I suppose that most of these issues would be worked out bit by bit in an evolutionary process throughout the extensive adoption period. Maybe Neil is right when he suggests that a quarter century from now self driven motor vehicles will be a distant memory and we will engage in all kinds of tasks while buzzing about in our autopilot cars. Or maybe, as has been the case with some hybrid and electric vehicles, people will still be wondering years from now why autopilot cars are so slow to catch on. I grew up watching cartoons on TV—a black and white TV until I was a teenager. While I would watch any cartoon, it didn't take me long to decide that Looney Tunes cartoons were on average a cut above the rest, at least when it came to cartoons developed after the early 1940s. The quality of the story lines, dialogue, humor, hand drawn art, vocal talents, and music put these cartoons in a class of their own. I very much liked other cartoons as well, especially the original Jonny Quest series. I was a fan of the original Scooby Doo series too; although, both of these were in different genres than Looney Tunes. But most of the cartoons in the broad Hanna-Barbera universe were, at least to me, of decidedly inferior quality to Looney Tunes. I frankly never cared for Tom & Jerry. And the 1973 Yogi's Gang series was among the most awful things ever done. Ditto with the addition of the Scrappy Doo character to Scooby Doo. I have a handful of DVDs in my personal collection—mostly history documentaries and a few 'classics' that were popular in my teen and young adult years. But I own some cartoon DVDs as well: all six of the Looney Tunes Golden Edition collections (yes, that's 24 full length DVDs), another Looney Tunes disk, and the entire original Jonny Quest series. I know that the shorts made during the Looney Tunes golden era are full of material that is horridly politically incorrect nowadays. As noted by Wikipedia, these shorts are filled with violent gags, "racial and ethnic caricatures," and "questionable vices." It isn't possible to remove insensitive factors without destroying the original art. It should be understood when watching these cartoons that some elements are clearly offensive by modern standards. Other material that today's professional victimology industry considers taboo is still funny and still offers valuable cultural and social commentary. You can see a lot of different cartoons on TV and on the Internet nowadays. Some of the offerings are pretty good. But others are pure garbage. Some of the so-called art (computer enhanced, no less) looks like it was drawn by Kindergartners on drugs. And I have yet to understand how infusing cartoons with endless streams of body function gags, potty humor, and all things icky offers a moral improvement over Elmer Fudd shooting Daffy Duck in the head in a slapstick scene. The 1990s the Animaniacs and Tiny Toon Adventures series tried to recapture some of the magic of the classic Looney Tunes while modernizing and taking it to a new level. Although not devoid of decent humor, the delivery was choppy and often annoying. The shows' frenetic paces frequently suppressed the magic rather than enhancing it. More recent offerings featuring the classic Looney Tunes stars don't quite capture the magic of the originals either. I don't often sit down to watch the cartoon DVDs I own. My kids watched them a lot when we first got them. But not so much any more. Still, the classic Looney Tunes shorts comprise a unique artistic and entertainment achievement that will probably never be repeated. A recent weekend found me doing work projects at a Boy Scout camp, something I have done regularly since age 13. The camp was relatively quiet compared to my visits during the summer when it was filled with several hundred excited campers. Our small crew worked outside between rainstorms. Unlike my father, I'm not particularly handy. I'm usually relegated to doing grunt work under the direction of people that actually know what they're doing. Yet I persist. In the evening we gathered around the hearth in the lodge. The camp director, who was an important mentor to me in my youth, told of filling the hummingbird feeder on the deck of the lodge a few weeks earlier and then watching the beautiful tiny birds take their fill of the abundant nectar he had provided. In his mind's eye my friend could imagine the hummingbirds thinking that they had found the most beautiful and wonderful flower ever formed as they gloriously drank from its abundant supply. He didn't mind that they seemed oblivious to the fact that he had worked to provide that resource. Just the joy of watching the minuscule fowl enjoying the nectar was thanks enough for him. The camp director then turned his gaze toward an open area of the camp that he could see from the lodge. At that moment boys were streaming to and from activities; some of them flitting about almost like little birds. It dawned on my friend that most of these boys were blissfully unaware of the vast effort that went into providing the experience they were enjoying. But the joy of just watching them enjoy the camp was thanks enough. When I was about nine we went to Disneyland. We went there again when I was about 13. My parents mostly spent their time shepherding and keeping track of us kids. They rarely rode rides unless we made them. There were other family vacations over the years. Most of them seemed designed to cater to us kids. When I was a sophomore in college my parents shocked us kids by installing a real in-ground swimming pool in their back yard, complete with diving board. Dad had loved swimming in his youth and my parents figured that a pool would be a good attraction for bringing kids and grandkids to their home as they aged. They were right about that. But I rarely saw my parents swim during the decades that they owned their pool. They worked tirelessly on cleaning and maintaining the pool, and doing all of the work of hosting frequent formal and informal family swimming parties. They put a lot of money into that pool over the years. But they almost never swam in it themselves. This puzzled me for a long time. But I now realize that those family vacations and that swimming pool were, for my parents, much like the hummingbird feeder was for my camp director friend. They were willing to put in the effort and expense for the sheer enjoyment of watching us enjoy these offerings, even if we seemed as heedless as the hummingbirds. I think that's what our Heavenly Father is like too. He knows that we can't adequately thank him for everything he does for and offers to us. Even the most aware among us is likely ignorant of many of the blessings God grants us daily out of his tremendous love for us. But God continues to bless us abundantly for the joy of watching us enjoy his blessings. I guess that's why I do a lot of the service that I do in my family and community. Despite my inadequacies in serving, I still relish seeing my children and others garner some benefit and even some enjoyment as a result of what I do, even if they don't comprehend the effort involved. Just watching them is thanks enough. There is a scene in the Disney animated feature Meet the Robinsons where the main character makes a spectacular mistake. Actually it's a repeat of a previous faux pas, but it impacts more people. As he begins to grovel and apologize, the boy's hosts begin cheering his failure. One character informs the confused boy that much is learned from failure, but "from success, not so much." The aptly named Paul Tough discusses precisely this point this Wall Street Journal article. American culture, says Tough, has for the past few decades been fixated on the idea that a higher IQ naturally leads to success. Vast resources are committed to enhancing intelligence in children in the hope of ensuring greater success, despite the fact that such approaches rarely produce lasting gains. Tough writes that "in the past few years, a disparate group of economists, educators, psychologists and neuroscientists has begun to produce evidence that calls into question many of the assumptions behind the cognitive hypothesis." These people assert that the most important childhood learning is not cognitive, but rather the development of "noncongnitive skills" such as "persistence, self-control, curiosity, conscientiousness, grit and self-confidence." A common term for these conglomerated noncognitive skills is character. "And character, even more than IQ," asserts Tough, "is what leads to real and lasting success." Of particular significance to the development of character is learning to overcome adversity. This means that success actually does begin with failure. Success is achieved in the overcoming of those failures. This calls to mind a joke about a young man that is struggling to get his start in life trying to find out how to succeed by interviewing a seasoned successful man. When asked how he became successful, the older man answers, "Good judgement." When asked how he developed good judgment he responds, "Experience." When asked how he developed experience, he replies, "Poor judgment." The development of character is an individual process that cannot be charitably distributed. Success can be had by anybody, but each must fashion his own by treading a road that includes many hardships. Unfortunately, American culture has worked to streamline the childhood development experience to the point that "American children, especially those who grow up in relative comfort, are, more than ever, shielded from failure as they grow up. They certainly work hard; they often experience a great deal of pressure and stress; but in reality, their path through the education system is easier and smoother than it was for any previous generation. Many of them are able to graduate from college without facing any significant challenges." Thus, a college degree does not guarantee success, even if it's earned from a top flight university. So how do we instill character in our kids? Tough says that "the most valuable thing that parents can do to help their children develop noncognitive skills—which is to say, to develop their character—may be to do nothing. To back off a bit. To let our children face some adversity on their own, to fall down and not be helped back up." Let kids struggle through failure instead of rushing to rescue them from it. In recent years LDS Church leaders for youth have undertaken the mantra, "You can do hard things." Programs have evolved to reflect this concept. While Tough's tough love approach is undoubtedly necessary, the church clearly takes the view that it's not enough to just let character development happen. A purposeful approach is required. This past summer, my middle child went on a seriously challenging pioneer trek. A hardy group of souls donned mid-19th Century trail attire and pushed fully laden hand carts up and down hills across many miles of the old Pioneer Trail on the barren Wyoming prairie, camping along the way. They endured harsh weather conditions, blisters, and sore muscles. One leader said, "Trek wasn't fun. But it was worth it. It doesn't have to be fun to be worthwhile." A few weeks later, this same child went backpacking with his scouting group in the High Uintas. Heavy rain toward the end of the week prevented them from achieving their goal of hiking a full 50 miles. But they put in a lot of miles with full packs on their backs. Having done a fair amount of backpacking in my time, I sought my son's opinion of the activity. I chuckled when he said that backpacking "is probably an activity for other people and not so much for me." Having been involved with youth groups for most of my life, I can say from a leader perspective that it's a lot easier to do fun and easy activities. It's hard to get youth to come to service projects where real work is involved. But that's often where a sense of fulfillment is found. Even with opportunities for youth to engage in challenging activities, I suspect that much of the real growth that leads to success comes from battling one's private failures. It is through these struggles that we discover our potential for excellence. As a kid I keenly felt the humiliation that resulted from always being the last one selected for any kind of athletic contest. I frankly would have preferred to avoid such activities, but sometimes it was either required at school or it was the only way to hang out with friends. I'm still lousy at team sports and I avoid them if possible. But failure at sports helped me discover potential for excellence in other arenas, many of which I still enjoy. I am reminded of the essay by author Lee Pitts titled, These Things I Wish for You that Paul Harvey popularized on his radio show. Pitts starts off by saying, "We tried so hard to make things better for our kids that we made them worse." He wishes for his grandchildren something better: "tough times and disappointment, hard work and happiness." It may well be that the only way to get the happiness result is to have the inputs of tough times, disappointment, and hard work. But how many of us are really willing to let our kids grapple with their own challenges? The natural parental instinct seems to be to swoop down and save them from what they most need, especially when we can afford to do so. Unless we resist this urge, we may end up with kids that have their heads jammed full of information but that are denied what we really wish we could give them: happiness and success. As we prepared to fetch flags for my Boy Scout son to put up throughout the neighborhood this morning in commemoration of Patriot Day, he asked why we were celebrating terrorist attacks that killed thousands of people. Having been a baby on 9/11/01, my son has no memory of life before the attacks. He doesn't remember a time when we were not at war in Afghanistan. He knows nothing of air travel without the indignity of being treated as a suspected terrorist. My wife explained that we were not 'celebrating' the terrorist attacks but commemorating our response to the attacks. We are remembering the victims and the horror, not to think of ourselves as victims, but to bolster our resolve to maintain the cause of liberty. We are reminding ourselves that liberty doesn't just happen; it is a task that requires a purposeful approach. Because there are people out there that hate liberty. I thought about my son's question as I drove to work. A program on the radio was replaying snippets from that day of infamy 11 years ago. Suddenly I was caught up in the odd mix of emotions I felt on that day, experiencing them anew for a brief time. 9/11/01 was a nationally defining moment. The now well-known photo of firefighters raising the American Flag amid the debris of the fallen towers became a defining symbol of the day. Many artists created works in the wake of 9/11. As I again felt the pervasive somberness of that day, I thought of Exhibit 13, one of the more poignant of these works. Oddly enough, it is by the Blue Man Group, which is more known for its clownishness than for its serious acts. Free of political commentary, Exhibit 13 evokes the memory of those ordinary people that died in the 9/11 attacks. You're familiar with the drill. When you create an online account for just about any service you end up creating several security questions to which hopefully only you know the answer. This adds a layer of security to the standard user name and password employed for logging on. Then hopefully you remember the answers you selected the next time you have to answer one or more of those questions. This is just one of the methods used for enhancing online security. Some sites use an image and/or an unusual phrase to verify that you are on the service's authentic website and not some phishing scam site. Many sites require you to enter obfuscated phrases that are difficult for computers to read to verify that you are a human and not some robo-entry program. No security paradigm is foolproof. Every layer of security adds a layer of inconvenience. Service providers constantly walk a narrow line between making you secure and making you frustrated. Security experts know that users frequently choose convenience over security. The higher the level of potential frustration, the higher the chance that the user will compromise his own security. Take the ubiquitous password, for example. The most common passwords in the world include 1234, 12345, and password, all of which are easily guessed by humans and computers alike. Frankly, people are frustrated by the number of varied passwords they must remember. Different sites have different password requirements and even experts disagree on what makes for a secure password. Password vaults are often cumbersome enough to render them as inconvenient as remembering multiple passwords. Some service providers are now using data mining to provide more security. When my wife recently accessed an online account she was presented with a series of questions she didn't choose. For example, she was asked to select from from a list a street name with which she had been associated. None seemed familiar until she dug through old files and discovered an address at which we had briefly lived years ago when we first married. A couple of other questions were obscure enough to require research as well. The other day I was helping my mother-in-law with her bank account. We reached a point where she had to call customer service. The service rep asked her a fairly long series of questions. I heard my mom-in-law answer, "None of the above" to several. After completing the list, the service rep informed Mom that she had answered too many questions incorrectly and that they could only help her if she appeared at a branch in person to verify her identity. On the one hand, I was pleased that the bank was serious about verifying Mom's identity before discussing account details. When the attempt failed, they implemented procedures designed to protect Mom's account. On the other hand, I was immediately unimpressed with the data mining security question process. If this method produces questions of such a recondite nature that the answers are not immediately discerned by the people that experienced the activities that gave rise to the data, how effective is it really? And how secure is it really? The data used for the questions that both my wife and my mom-in-law faced came from publicly available records. How long will it take before the bad guys figure out which questions are likely to be asked? How hard will it be for them to derive the answers from a few Google searches? They might actually be better at answering these questions than the real account holders. We all want our personal data to be secure online. But I think this new data mining security question method can safely be scored as a customer relationship and security failure. It is cumbersome enough to drive customers away, especially when it prevents them from legitimately using the services it is designed to protect. And, as mentioned above, it is likely only a matter of time until the bad guys overcome the protective wall that frustrates regular customers anyway. As a teen I heard a Soviet defector talk about life in the USSR. I was somewhat mystified when he explained that many people in his home country were afraid of liberty. Why would anybody not want liberty? Although liberty offered more affluence, these people feared the unknown and personal accountability. Despite their dismal circumstances, they were addicted to benefits offered by the state. Their dependency culture had bankrupted their moral character, robbed them of initiative, and turned them into willing serfs. Political economist Nicholas Eberstadt in this WSJ op-ed provides some rather stunning evidence to bolster his claim that Americans are well on their way to the kind of character debauchery that was endemic to Soviet life a few decades ago. "The growth of entitlement payments over the past half-century" he writes, "has been breathtaking. ... Even after adjusting for inflation and population growth, entitlement transfers to individuals have grown 727% over the past half-century...."
Even after all of the New Deal programs, federal spending was mainly concentrated on "limited public services and infrastructure investments and ... defending the republic against enemies foreign and domestic" as late as 1960. Now transfer payments to individuals comprise two-thirds of all federal spending. The terms "entitlements" and "transfer payments" are far too antiseptic. What these terms mean is taking property from someone and giving it to someone else using the coercive power of government—activities that bear more than a passing resemblance to behavior proscribed by the 8th and 10th Commandments. We should be careful about being hoodwinked by cleverly sanitized terms used by the political class. When they say "invest" they mean increased government spending. When they say "ask" they mean increased taxation and/or regulation under threat of force—asking in the same way that a mugger asks for you wallet. Despite current partisan rhetoric, Eberstadt notes that "the explosion of entitlement spending" has been a bi-partisan affair. "Between 1960 and 2010, the growth of entitlement spending was exponential, but in any given year, it was on the whole roughly 8% higher if the president happened to be a Republican rather than a Democrat." A politician is a politician regardless of party. There is no shortage of those that suggest that our bloated entitlement spending is exactly the right thing for America—the perfect prescription for assuaging the evils of the days when people actually had to worry about how they would get their next meal. They bandy about terms like "community" and "social justice" to justify programs that turn sovereign citizens into government subjects that can more easily be controlled by their government masters. "From the founding of our nation until quite recently, the U.S. and its citizens were regarded, at home and abroad, as exceptional in a number of deep and important respects. One of these was their fierce and principled independence, which informed not only the design of the political experiment that is the U.S. Constitution but also their approach to everyday affairs." "The corollaries of this American ethos were, on the one hand, an affinity for personal enterprise and industry and, on the other, a horror of dependency and contempt for anything that smacked of a mendicant mentality. Although many Americans in earlier times were poor, even people in fairly desperate circumstances were known to refuse help or handouts as an affront to their dignity and independence. People who subsisted on public resources were known as "paupers," and provision for them was a local undertaking. Neither beneficiaries nor recipients held the condition of pauperism in high regard." Entitlement spending is swamping this old system of ethics. 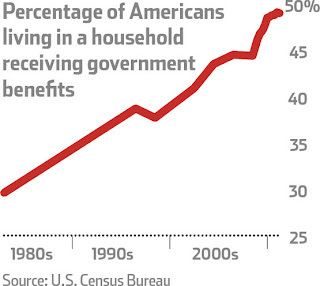 In fact, Eberstadt notes, "The U.S. is now on the verge of a symbolic threshold: the point at which more than half of all American households receive and accept transfer benefits from the government. From cradle to grave, a treasure chest of government-supplied benefits is there for the taking for every American citizen—and exercising one's legal rights to these many blandishments is now part of the American way of life." It would be easy to blame all of this on the political class. But that would be like blaming the whole problem of drug addiction on the pushers without respect to their addicted clients that demand the drugs. Pushers would not exist without junkies. Ah, but amid the sounds of Americans gorging themselves at the government trough one occasionally hears someone impertinently asking how we're going to pay for this feast. Some pause momentarily to consider this before shrugging it off and figuring that the same political class that brought the swill will somehow figure out how to keep the supply coming. "As Americans opt to reward themselves ever more lavishly with entitlement benefits, the question of how to pay for these government transfers inescapably comes to the fore. Citizens have become ever more broad-minded about the propriety of tapping new sources of finance for supporting their appetite for more entitlements. The taker mentality has thus ineluctably gravitated toward taking from a pool of citizens who can offer no resistance to such schemes: the unborn descendants of today's entitlement-seeking population." It's worse than taking candy from babies. We are taking from pre-babies and even the babies of those pre-babies—the unborn that have no vote, no lobbyists, and no voice in government. And we somehow find this morally acceptable. Unfortunately, many of those unborn on whose labor we are banking may never be born. It has been shown over and over again that populations that devolve into dependency on social programs lose their desire to bear and raise children. Combining decreasing population with the time value of money means that every dollar we steal from children of the future will amount to many dollars in their lifetimes, dooming them to a lifetime of servitude to pay for our excesses. While some citizens and even some politicians are working to draw attention to America's impending fiscal disaster, a greater concern, suggests Eberstadt, is a "possibility [that] is even more frightening—namely, that the present course may in fact be sustainable for far longer than most people today might imagine." The nation still "has vast resources to squander." Eberstadt chillingly opines, "Such devices might well postpone the day of fiscal judgment: not so the day of reckoning for American character, which may be sacrificed long before the credibility of the U.S. economy."